N.O.C. ™ is a 100% natural product that is odorless non-staining that quickly gets rid of odors by balancing the microbial activity. It is a liquid biological stimulator developed from a complex fermentation process, which contains safe biological activators that supercharge healthy aerobic bacteria that are already present. It does not contain any live organisms or enzymes. It is odorless, organic and environmentally safe. 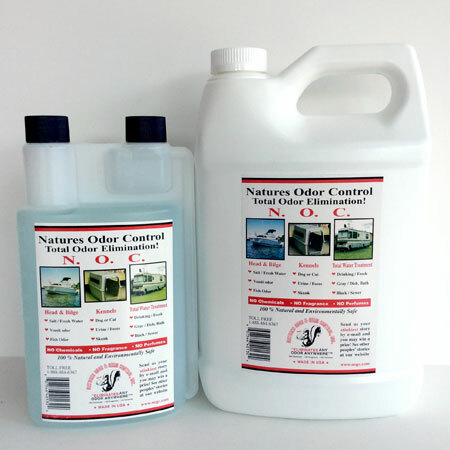 N. O. C. ™ liquid effectively controls bacterial odors in areas such as marine heads and bilges, grease traps, RV total water treatment, skunk odor, dog runs and kennels, contained animal houses, septic systems, and even down to the dog’s bad breath. 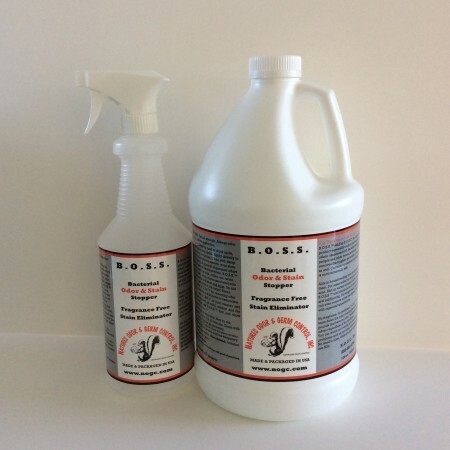 Nature’s answer to odor control problems without the use of chemicals. N.O.C. ™ is a 100% natural product that is odorless non-staining that quickly gets rid of odors by balancing the microbial activity. It is a liquid biological stimulator developed from a complex fermentation process, which contains safe biological activators that supercharge healthy aerobic bacteria that are already present. It does not contain any live organisms or enzymes. It is odorless, organic and environmentally safe. More simply, it is a complex solution of amino acids, vitamins and trace minerals derived from blue-green algae that stimulates a natural bacterial process to eliminate all types of bacterial odors without a cover up fragrances. Natures Odor Control (N.O.C. ™) is designed to help the microbes do their job more efficiently. It’s like a natural health food drink for the organisms. Microbes are truly amazing creatures. These microscopic organisms have the awesome responsibility of cleansing and feeding everything in nature. Think of them as the “digestive system of the earth.” Microbes eat every kind of organic matter found in nature: trees, shrubs, animals, animal waste, insects, leaves, crops, fruits, flowers, etc. Plus these tiny organisms have the remarkable ability to disassemble anything a man can put together. They’ll break down food, paper, wood products, and fabrics. They will even digest tough things like crude oil, gasoline, petroleum products, and complex chemicals and steel. Their job is to return wastes of the earth back into the life cycle so nature can continue to sustain itself. No matter what the waste, there is a microbe to digest it. 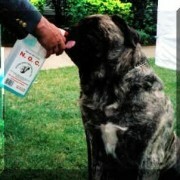 EASY TO USE: N.O.C. ™: Simply mix with warm (not hot) water and apply to any type of new sprayer. Average Odor Problems: Mix 1 part N.O.C. ™ with 5 parts warm water. Difficult Odor Problems: Mix 1 part N.O.C. ™ with 2 parts warm water. Severe Odor Problems: Mix 1 part N.O.C. ™ with 1 part warm water. For RV Fresh / Drinking – 1/2 oz. in 30 gallons gets rid of bad tasting water or takes the chemical taste out of plastic. Gray / Dish, Bath – 1oz. in 40 gallons -Just to keep odor free. Black / Sewer – 1 oz. for every 10 gallons capacity per week or dumping. Be sure to rinse out the tank with fresh water to remove chemicals before you start using N.O.C. ™. Recommended method: Clean tank out by rinsing several times with plain water. Fill one toilet bowl and add 1 oz. of N.O.C. ™, then flush. You can always add more N.O.C. ™ if you can’t dump right away. Head and Bilge Salt and Fresh Water Vomit Odor Fish Odor. Marine bilges – 1 gallon per 1,000 gallons of bilge as needed. Maybe mixed with salt water. Mix 16 oz. (1 pint) of N.O.C. ™ to 1 gallon of 80-100 degree water the first week. Spray areas. Then each month increase water amount by one gallon until you reach a satisfactory mix rate for your needs. Most runs can get up to 15 gallons of water to 1 pint of N.O.C. over several months. N.O.C. ™ can be sprayed directly onto animals and left to dry. This mix will cover a 20′ x 50′ area or 1,000 square feet. ALWAYS USE A NEW SPRAYER, NO CHEMICALS. Pet Owners – Urine in carpeting: refer to instructions with N.O.G.C. Pet Odor Elimination Kit. Natures Odor Control (N.O.C. ™) is nature’s answer to odor control problems without the use of chemicals. N.O.C. ™ is a 100% natural product that quickly gets rid of odors by balancing microbial activity and keeps odors from returning. USE N.O.C. ™ IN R.V. Holding Tanks, Portal Potties: No formaldehyde, chemicals or staining dyes. Marine Bilges: Eliminates odors and breaks down the hydrocarbons from gasoline and oil. Works in fresh or salt water. Grease Traps: Emulsifies and liquefies grease buildup in drains and sewer lines, thus eliminating the odors. Contained Animal Houses: Dog runs, kennels, chicken houses, turkey houses, emu farms, mink farms, hog confinements, etc. 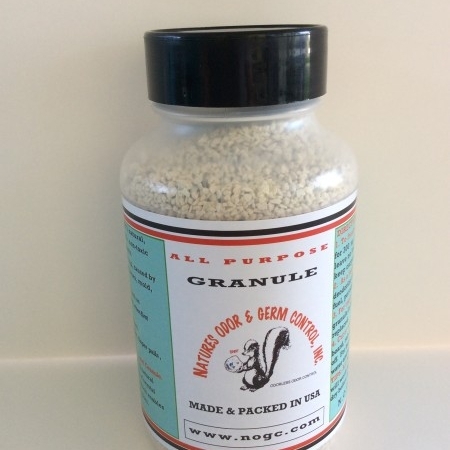 Greatly reduces ammonia build up and speeds up the decomposition process of animal waste, stimulates healthy bacteria which makes a healthier environment for the animals. Skunk odor on the animal: Wet animal thoroughly, then apply N.O.C. ™ undiluted and work into the coat and leave for an hour. Bathe the animal with additional N.O.C. ™ and Pet Powder in the water. Dry and mist the animal with a fine mist of product and let dry naturally, be sure to use in mouth and ears. If any odor remains you may want to apply Pet Powder to face, muzzle, and coat. Skunk odor under buildings: Mix 1 part N.O.C. ™ with 1 part warm water. Apply 1 gallon for 500 square feet. Dogs breath: Spray N.O.C. ™ full strength into animals mouth. Dog run and kennels: Mix 1 part N.O.C. ™ with 8 parts warm water. Spray the area that is producing the odors. Repeat application weekly. Once odors are controlled N.O.C. ™ can be mixed up to 1 part N.O.C. ™ with 15 parts warm water, depending on the intensity of odors. 1 pint of N.O.C. ™ mixed with 1 gallon of warm water will treat approximately 1,000square feet (20’ x 50’ area). N.O.C. ™ can be used on concrete, gravel, dirt and grass areas, will not harm grass or shrubs. Contained animal houses (chicken, pigs, etc. ): Mix 1 part N.O.C. ™ with 5 parts warm water. Spray the area that is producing the odors. Apply diluted mixture at a rate of 1 gallon per 1,000 square feet (20’ x 50’ area) on first application. Repeat application weekly. 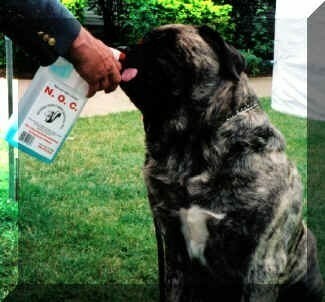 Once odors are controlled N.O.C. ™ can be mixed up to 1 part N.O.C. ™ with 8 parts warm water depending on the intensity of odors and other related problems. We recommend this method: Clean tank out by rinsing several times with plain water. Fill one toilet bowl and add 1 oz. of N.O.C. ™ then flush. You can always add more N.O.C. ™ if you don’t plan to dump right away. Portable potties portable johns: Add 4 ounces N.O.C. ™ per 50 gallons of capacity each week. Marine bilges: Add 1-gallon N.O.C. ™ per 1,000 gallons of bilge as needed. Grease traps: Mix 1 part N.O.C. ™ with 10 parts warm water. Pour 8 ounces of mixed solution into each drain weekly. Septic systems (private/rural): Flush 1 quart of N.O.C. ™ into any drain leading to the septic tank. Add 1 pint one week later. Then add 1 cup each month for preventative maintenance. Pet owners: Sooner or later this will happen Urine in carpeting refer to steps of instruction with N.O.G.C. 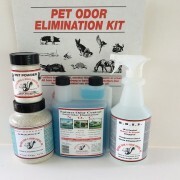 Pet Odor Elimination Kit.